The future of the RSAF? Made by Lockheed Martin, the plane is fitted with the latest intelligence-gathering computer system, the supersonic jet can fly at nearly twice the speed of sound. Welcome to Dallas Fort Worth, where production of what has been labelled the world's most advanced fighter jet is continuing apace. The F-35 Joint Strike Fighter can travel at nearly twice the speed of sound, has stealth features that make it tough to detect by enemy planes and radars, and high-tech systems which let it strike the enemy first before being spotted. But the plane, which Lockheed Martin started developing in 2001, has also become a lightning rod for criticism. It has faced delays, ballooning production costs and a series of production flaws, such as a fuel tank prone to exploding, a vulnerability to lightning strikes and even a faulty ejection seat which could snap a pilot's neck during ejection. But that has not stopped 11 countries, including the United States, Britain, Israel, South Korea and Japan, from buying the F-35, with Denmark possibly joining the list after its defence ministry made a pitch to Parliament two weeks ago to opt for fifth-generation aircraft. Now, Lockheed is looking to sew up a multibillion-dollar deal with Singapore, which is in the final stages of considering if it will also go down the F-35 route and buy both the conventional F-35A and the F-35B, which takes off from shorter runways and can land like a helicopter. Several sources told The Sunday Times that Singapore looks all but certain to say yes to the F-35s, explaining it is "not a matter of if but when" and that a decision may be expected as early as next year. That will be when the Pentagon issues a notice to the United States Congress highlighting the possible deal. If Singapore does buy the plane, it will probably receive its first F-35 around 2021 when the warplane is considered "full matured", said one source. The Ministry of Defence (Mindef) would only say that the F-35 "is still under evaluation", citing Defence Minister Ng Eng Hen's comments to Parliament in 2013 that fifth-generation jets, such as the F-35, are "potential options". "As a small country with no strategic depth, Singapore will always need superior air capabilities to protect its interests and borders," said a Mindef spokesman. Dr Ng has seen both the F-35A and F-35B jets up close as recently as last December. A Republic of Singapore Air Force (RSAF) evaluation team has also been to Lockheed's aeronautics headquarters in Dallas Fort Worth at least twice in the last three years to go through their paces in F-35 simulators. The Pentagon's F-35 programme chief, Lieutenant-General Christopher Bogdan, paid an unpublicised visit to Singapore in February during the Singapore Airshow, and was said to have made his closing pitch to the country's military leaders - two years before the F-35's development is scheduled for completion. For Singapore to be mulling its options at this stage is unprecedented, said observers. It acquired its F-16s and F-15s years after they were built in the 1970s and battle-tested. But this also means Singapore needs to be more careful that it will not be buying into a problematic platform. A source said: "This is the first time that we are buying a fighter jet that is fresh off its development phase. We need to make sure that the platform is ready." It has been a bumpy ride for the F-35. In the latest blow, engineers last year uncovered computer glitches that can shut down the plane's radar, requiring pilots to turn it off and on again. Such issues have pushed the F-35's development seven years behind schedule and made it the world's costliest weapon programme in history. The initial estimate in 2001 had been around US$200 billion. Today, the Pentagon has already spent US$400 billion (S$553 billion). The F-35 was also reportedly outclassed by a 40-year-old F-16 in a dogfight last year. Last month, US Senator John McCain, a former navy pilot, slammed the F-35's troubled history, saying it "has been both a scandal and a tragedy with respect to cost, schedule and performance". Yet, pilots who have flown the F-35 told The Sunday Times that it is a cut above the rest. Lieutenant-Colonel Gregory J. Summa, who is the commanding officer at the VMFAT-501 squadron which trains the US Marine Corps' F-35 pilots, said: "The airplane has more power than others and the power is there immediately. "Because of its low observable design, there is not a lot of drag, so the airplane accelerates very, very fast and does not decelerate. You have to force the airplane to slow down." Major Michael Rountree, the squadron's executive officer, has clocked 400 hours on the F-35. The 38-year-old said the jet was much easier to fly, allowing him to pay more attention to threats. The information collected by the plane's many sensors is also put together in one single display, which means the pilot can quickly have a complete picture of what is happening around him, he added. Lockheed's F-35 chief test pilot Alan Norman, who has clocked 6,000 flying hours in more than 70 types of aircraft such as the F-22, said the plane is also more survivable and lethal than any other. He said: "Nobody is going to sneak up behind an F-35 because you know where every adversary is in the battlespace well before they are on your tail." Maintenance crew said F-35s take half the time to maintain, given its advanced computer system. Lockheed's executives assure that all the glitches will be fixed by 2018. Mr Steve Over, Lockheed's F-35 business development director, said the defence manufacturer has "a solution on hand for every one of the technical flaws pointed out". "The flaws found are not unlike any weapons programme that is still under development", added the engineer, who worked on F-16s for 29 years before moving to the F-35. Defence analyst Kelvin Wong said developmental challenges are par for the course for modern combat aircraft programmes, more so with the F-35 programme's scale and complexity. Pointing to the F-16 programme, which is one of the most successful with at least 25 countries flying over 4,500 jets, Mr Wong, who is IHS Jane's Asia-Pacific defence technology reporter and upgrades editor, said the F-16 suffered "subpar performance" for about 10 years. Lockheed is also optimistic as it has been able to cut production costs by 60 per cent since the first plane rolled off its factory floor in 2010. It said it is on track to shave a further 20 per cent off the current price by 2019. By then, each F-35 will hopefully cost around US$80 million to US$85 million. 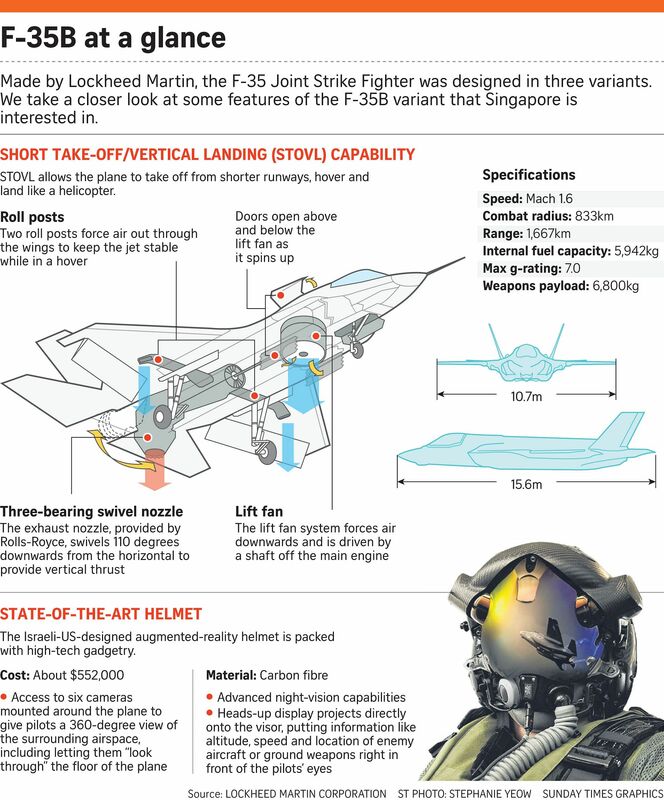 The optimism was palpable when The Sunday Times visited Lockheed's F-35 factory floor. Visitors were not allowed to take photos or capture videos in the high-security production line, which is about 1.6km long. The area was a hive of activity, with engineers and technicians working like clockwork to assemble the warplanes. To meet expected higher demand and ramp up production to hit full steam by 2019, Mr Over said Lockheed will increase the number of final assembly stations from 14 to 22. More hands will also be needed, with 1,000 people to be hired by 2020 to add to the current 5,000-strong team. Mr Jack Crisler, Lockheed's vice-president of F-35 business development and strategy integration, said the "sweet spot" for countries to lock in their orders would be between next year and 2018, to gain economies of scale. He expects interest from other countries to grow when Japan and Israel start to take delivery of their warplanes and fly them, putting paid to doubts of a sustainable worldwide F-35 fleet. Mr Crisler said countries will want to be in a growing shortlist that Lockheed and the Pentagon will pick from to set up maintenance and repair warehouses around the world. DOES SINGAPORE NEED THE F-35? Beyond the marketing spin, questions still swirl over the need of having the F-35s to protect Singapore's airspace. Currently, the country has fourth-generation fighters F-16s and F-15s. While the 60 F-16 jets are getting their midlife upgrades to extend their operational lives by another 20 years, the F-15s, which the Republic is believed to have as many as 40 of, are considered the best currently. Defence observer David Boey, who sits on the Advisory Council on Community Relations in Defence, believes existing fighters are "numerically and technologically superior to that of anyone in the immediate region who may want to pick a quarrel with us". He said: "In the absence of the F-35, options include expanding this fighter force with latest variants of these or other warplanes." He added that the hefty price of the F-35 is not the chief hurdle. The F-15s were said to be about US$120 million each when Singapore bought them. He said: "The deal-breaker is convincing ourselves that the F-35 can perform as advertised and serve as a credible deterrent. With enough time and money, any bug can be fixed. We need to ask ourselves if the patience and money will always be there to bankroll this project." Defence analyst Richard Bitzinger thinks Singapore is in no hurry as it already has an "overwhelming (air) superiority" over its regional neighbours, although several, including Indonesia and Malaysia, are also eyeing fifth-generation platforms. "I think that Singapore will eventually opt for the F-35, due to its overall technophilia, but it can afford to wait," said the senior fellow at the S. Rajaratnam School of International Studies. Other observers said there is also a limit to how much the RSAF can upgrade its existing fourth-generation warplanes to outdo the enemy. As one put it: "You can only do that much with a Toyota and Suzuki. Given the strategic challenges, we may need to get a sports car to stay ahead."